I've got a fun & easy new pattern done up for a Market Bag with a handy-dandy elastic & cord lock combo to prevent those annoying grocery spills in the trunk or truck-bed. Fancy it up with those hexies you've been making on your summer road trips that you don't know where to put. Or you can re-purpose an old fabric shower curtain like the one I used in my pattern. I found this one for $1 at a neighborhood garage sale! 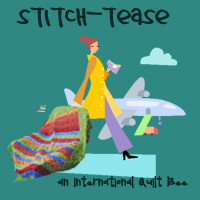 You can get the pattern in my Craftsy Pattern Shop for the low low price of 99 pennies by clicking here. Or you can leave a sweet comment at the bottom of this blog with your email address and I'll send it to you for free! :) ...just cuz I love ya. Cool! I love the cinch & lock idea- hate the tip-overs in the trunk! Ill need to make one. Pattern #2 I'm so proud of you! 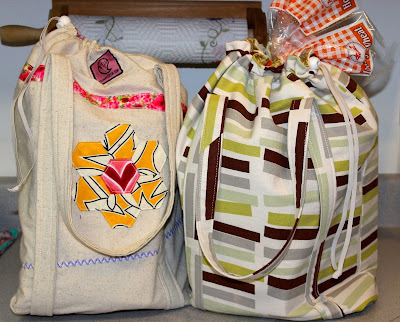 Great looking pattern - have a fun idea for repurposing old vintage fabrics using your bag. thanks for sharing the pattern!